Better education won't fix inequalities rooted in capitalism. At Milwaukee Area Technical College’s graduation ceremony earlier this year, Secretary of Education John B. King Jr, told the story of Yucca Donahue. Yucca is a single mother who works 12 hours a day operating a daycare center out of her house. She decided to go to MATC both to expand opportunity for herself, but also for the sake of her students . . . When a fire destroyed the kitchen in her daycare center and cost a considerable amount of money to repair, it was simply for Yucca another challenge to overcome. Yucca insisted on going to school the same day the fire occurred because she understood how important it was not to miss class. Of course, King’s narrative never questions why Donahue had to work twelve hours a day, or why Randolph’s employer laid him off after thirty years, leaving him without the ability to make ends meet. The centrist ideology of education is so brazen that it holds out such stories as inspirational proof that education will be the force that saves people’s lives by putting them on a path to opportunity. But just a few weeks prior to the article’s publication the job numbers came out; they were the worst since 2010. “The US economy only added 38,000 jobs in May, according to the Labor Department. It was the worst monthly job gain since 2010.” Not only that, but the majority of jobs added were service jobs. August wasn’t much better. In September, more new jobs were available, but less than expected. As scholars like Peter Kappelli at University of Pennsylvania’s School of Management warn, having a degree will do nothing to protect you against the sometimes violent and unpredictable patterns of market activity in a capitalist economy. Kapelli’s comment sits within a long debate about the role of education in American society. Henry J. Perkinson, in The Imperfect Panacea, American Faith in Education 1865–1965, traces the centrist’s promise of education from Horace Mann to John Dewey to Lyndon B. Johnson. Summarizing this history, economists Herbert Bowles and Samuel Gintis set out two versions of the promise: democracy and technocratic meritocracy. John Dewey argued for the democratic promise of education. In this view, schools integrate youth into adult roles required by society; schools give young people a chance to openly compete for existing positions and privileges, thereby equalizing inequality; and schools promote psychological and moral development. The integrative, egalitarian, and developmental roles schools play in society match the needs and context of democratic institutions. The promise of school in this case is that schooling should and will prepare students to participate in a democratic society, and that by extension it serves democratic purposes. Alongside Dewey were the functionalist sociologists and neoclassical economists who focused on industrial progress rather than democracy and promoted a technocratic-meritocratic version of schooling’s promise. According to this view, as industry becomes increasingly complex and markets require competitive production, the labor force needs to upgrade its skills. Schools provide this necessary function and, accordingly, those who study hard will be able to find work despite disruptions in the labor market caused by new technology. This view traces back to Horace Mann in the 1840s during industrialization, but continues today in the rhetoric about STEM careers, for example. Whether rooted in notions of democracy or technology, both versions of the promise promote the notion of a compensatory education: that schools can compensate for unequal distribution of resources, rights, and recognition in American society. But not everyone was convinced by the compensatory view. Bowles and Gintis critiqued the centrist promise in their landmark Schooling in Capitalist America. They articulated a more critical position on education, arguing that public education is part of a broader process of social reproduction: schooling activities correspond to existing echelons of social hierarchy and opportunity, preparing students for positions within that hierarchy. Schooling does not lead to opportunity in the sense that it creates opportunity; it simply prepares students to exist (or not exist) within the opportunity structure that the government and economy create. Consider the job market numbers above. Schooling cannot control the number or kind of jobs available in an economy. For the last decade, for example, it was probably a good idea (in terms of potential income) to study petroleum engineering as an undergraduate. Today, given the dramatic fluctuations in oil prices, it’s perhaps not such a great idea. No matter how many people study petroleum engineering, or how good petroleum engineering education gets, it’s the petroleum industry and its fluctuations that determine how many jobs will be available and their respective salaries. Sociological research in education supports this. Earlier this year, sociologists of education Douglas B. Downey and Dennis J. Condron published a retrospective on the Coleman Report, a large-scale research study mandated by the Civil Rights Act in 1966 to examine schooling success among the poor. Fifty years later, the authors conclude that there is a “theoretical vertigo in the sociology of education” about the question of school’s effect on inequality. The authors even advocate for the compensatory view, and show that school can be compensatory in socioeconomic gaps in cognitive skills and child obesity, but admit there is no clear data about the relationship between schooling and income inequality. Everyone knows that income inequality has increased exponentially between the 1970s and today. Yet at the same time that income inequality has skyrocketed, so has schooling. United States citizens are more educated than they ever have been. More people have graduated from more kinds of schools than at any point in history. This is clearly not the case. As economists Thomas Piketty, Emmanuel Saez, and others have shown, the share of the top 1 percent increased exponentially in the second half of the twentieth century. Consider this in relation to the following graph, which charts educational attainment in the United States between 1940 and 2014. The graph shows the opposite: educational attainment increased markedly, even during the moments where economic inequality also greatly increased. These data show that wealth goes to the wealthy, not the educated. At the macro-level, there is no relationship between socioeconomic success and schooling. Of course one must go to school to find a place in the economy, both in terms of job and status position. But just because getting a job requires having a degree doesn’t mean that more and better schooling will cause there to be more available positions society-wide. To get a job, you have to have a degree. But you don’t have to get a job because you have a degree. 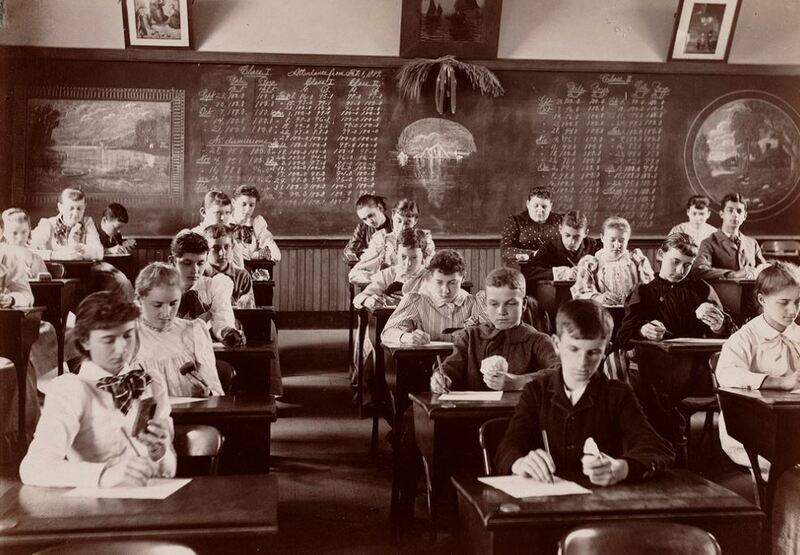 The reproduction view of schooling enjoyed a brief time in the spotlight of educational thinking. Alongside Bowles and Gintis, sociologists Pierre Bourdieu and Jean Passeron theorized educational reproduction as a form of symbolic violence and transmission of cultural capital. The philosopher Louis Althusser and his students Roger Establet and Christian Baudelot claimed schools surpassed the church in the industrial period as the most impactful ideological state apparatus. The sociolinguist Basil Bernstein wrote two volumes on how pedagogy and instruction encode class positions through students’ and teachers’ speech. But during the Cold War, the reproduction view was largely written off as being too deterministic. Critics like Paul Willis, Henry Giroux, and Jean Anyon argued (drawing from thinkers like Paulo Freire and Stuart Hall) that such claims harken back to old economistic Marxist theories where the economic base determines what happens in the political, social, and cultural superstructure. The reproduction view, they argued, treats schooling as superstructural, which means that it’s determined by economic forces whether or not educators try to teach for radical social change or youth cultures try to resist the system. This vulgar determinism, they argued, leads to a problematic lack of agency on the part of teachers, students, and educational activists who do what they do because they want to make society a better place, not just hold society in place where it is. The critique launched a paradigm called resistance theory in educational research, and partly inspired what we know as critical pedagogy. These critiques were valid and resistance theory has made important contributions to educational thinking. Yet it is not without its own problems. Its basic insight that schools are sites for social change is similar to the centrist’s claim that schools can rectify social ills. And perhaps because of this similarity, some of resistance theory’s claims have been recuperated by the school reform movement. After a period of relative success in mainstream academic and intellectual circles, the idea that better schooling can counteract oppression played a starring role in justifications for the No Child Left Behind Act. George W. Bush, in the 2000 Republican presidential primary, used rhetoric that drew from institutional critiques of education to advance a pernicious policy of high-stakes testing and accountability. Phrases like “the soft bigotry of low expectations,” for example, which Bush and his surrogates used throughout the campaign and his presidency, claim that having high expectations for performance on difficult tests can help eradicate social inequalities like racism. While researchers still use reproduction theory to understand certain specialized aspects of school’s role in inequality, the theory’s radical core has been somewhat lost in educational thinking in the public sphere. It should be revived in a way that absorbs and utilizes the critiques laid out in resistance theory. This is particularly urgent in the present moment, when the school reform movement holds increasing sway. In their report, Downey and Condron argue that focusing on the compensatory qualities of schooling distracts the public from understanding the need for a functioning welfare state in the United States. People in the United States are more reluctant than Canadians or Europeans to help families via non-school policies (e.g., increasing the minimum wage, greater public transportation, more generous family leave policies, broader access to health care, pro-worker legislation, and reducing mass incarceration) . . . This cultural position has consequences and too often directs policy efforts towards schools when the source of the problem is elsewhere. In the context of US capitalism, a socialist education is a revolutionary education. Our objective for US schools and colleges here and now is not they should become the embryo of the good society but that struggles around these institutions, and the educational process itself, should contribute to the development of a revolutionary, democratic socialist movement . . . The struggle to liberate education and the struggle to democratize economic life are inextricably related. Education’s real promise is that it is one site among many others in the struggle to transform the social structures that create inequality. Rather than a path to opportunity, it is an opportunity to continue on the path towards a more equal economy and society. In this sense, we should think of education as a site for contributions to the larger project of fighting capitalism, not a compensatory panacea for capitalism’s shortcomings. Better education won’t fix inequalities rooted in capitalism.